The newly announced Apple TV runs iOS, despite not having the traditional iOS interface, according to a report on TUAW. 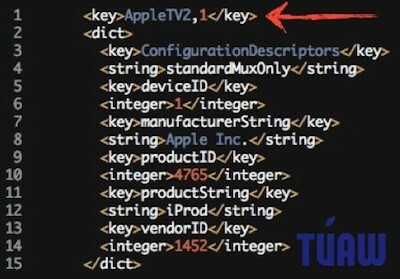 Citing an iPhone developer who went digging around in the latest iOS 4.2 beta, it was found that ‘AppleTV2,1’ was listed in the latest USB device configuration files. Assuming this holds true, the new $99 Apple TV will surely be a hit with iOS jailbreakers and the mod community. It is widely believed that the new Apple TV is basically an iPod touch sans screen and with a smaller storage capacity. Although not confirmed, it’s assumed that the new device has 4GB to 8GB of local storage capacity, which would be adequate to store necessary files and cache streamed media and movies. This is going to be huge if true. With 8GB of flash memory and running iOS, it’s only a matter of time before the devteam gets the Apple TV running a full fledged version of iOS so that we can then play games and use our normal apps directly on a TV with a hand-held iOS device as a touchscreen remote. Apple should have publicized this in the first place, with all the TV manufacturers starting to include apps in their hardware it seems like a no brainer to explode into the living room with everything that’s already on the App Store. Surely they thought of this and chose to avoid it for some reason? Since even the Apple store lists the new Apple TV as an “ipod family” device, it seems that we all should have assumed it would be running iOS.